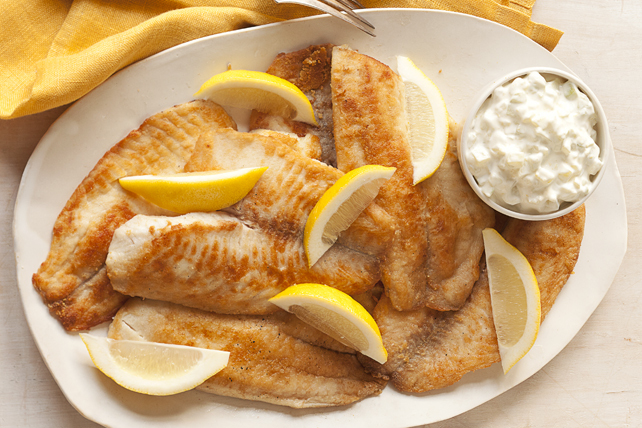 Golden on the outside and tender on the inside, this pan-fried crusted tilapia is served with our version of fresh tartar sauce. Combine first 4 ingredients. Refrigerate until ready to use. Mix cheese and flour in pie plate. Dip fish, 1 fillet at a time, in cheese mixture, turning to evenly coat both sides of each. Heat oil and butter in large nonstick skillet on medium-high heat until butter is melted. Add 3 fish fillets; cook 4 to 5 min. on each side or until fish flakes easily with fork. Remove from skillet; cover to keep warm. Repeat with remaining fish fillets. Serve with lemon wedges and steamed fresh green beans. Prepare using any other kind of white fish, such as halibut. Add 1-1/2 tsp. chopped fresh dill or 1/2 tsp. dill weed to sour cream mixture before refrigerating.